The villa lies in the countryside of Taormina in a gorgeous old family estate producing lemons, oranges, wine and olive oil, 2 kms from the sea and 7 from the center town of Taormina. Restaurants, shops and facilities are distant a few kms from the property (from 1 to 5). The house has been recently restored conjugating the charm and the modern utilities such as air conditioning, heating, fridges in all bedrooms, ice maker and wifi. Fit for max 12 people the house is ideal for families and groups who like luxury and the peace of the countryside. The house is surrounded by the greenery of the garden, grapes plantation, lemon grove and Saracen olive trees. The exclusive pool has a spectacular view on the vineyard and the Etna Volcano. There are 5 double bedrooms (4 can be converted into twins) with their own bathroom with shower ensuite - a comfortable mezzanine with 2 single beds, cloak room, library and small terrace with view on the Etna volcano - a large comfortable sitting room with stone fireplace -a charming confortable dining-kitchen room - a 30 sqm terrace. The property is ideal for family groups or friends groups, yoga retreats, cooking classes. Top for children as well. Ideal for country lovers but close to Taormina and to the beach. Max 12 pax. The house is surrounded by the greenery of the garden, grapes plantation, lemon grove and Saracen olive trees. The exclusive pool has a spectacular view on the vineyard and the Etna Volcano. There are a large gazebo in the garden to have meals or to stay alfresco admiring the volcano and a stunning barbecue area in the lemongrove. Amazing in Summer, fantastic for a Spring holiday and in Autumn. Ideal for Christmas and Easter. Daily maid and a super sicilian cook are available on demand. For all other infos see the rental agreement. Ideal for country lovers. Close to Taormina and the beach. Beautiful country, lemons and grapes, garden and flowers, great view of Etna. A mantainor every day for any incovenience. The owner lives in the estate. daily maid and cooking service (sicilian kitchen) are available on demand. Beautiful villa well located to explore the area. Our extended family of 9 stayed her for a week in July. The views from the grounds are beautiful and we were very surprised by the amount of space you have outside with plenty of room to sit in the shade, swim and sunbathe. We also enjoyed a game of football with Etna as our bsckdrop! All the bedrooms are a good size with their own bathroom. Monica was very welcoming and helpful and a real star. We booked Maria to cook for us one evening which was fantastic. As well as amazing food, Maria was so friendly. Nearby we visited Taormina, Isla Bella and Naxos which are all lovely but very very busy. We loved Castelmola as very peaceful and Ragusa. The only things I can suggest in terms of improvement would be a better bbq (in size and weight); a larger kettle and some more sun loungers. Would definitely recommend for a group of friends or family. Excellent villa in a beautiful location with views of Etna across the vineyard from the garden. Swimming pool well used and shaded outdoor table and chairs welcome in the heat. Accommodation was spacious and clean, although beds somewhat hard, and the kitchen had limited equipment. Easy walk to village, which had many ice-cream shops to the delight of our children and also simple shops and restaurants. Many things to do in the area including visiting Taormina, Mount Etna, River gorge and beaches/boat trips. Monica was an excellent manager - very friendly and efficient, and the meal cooked by Maria for us was amazing. I think it should be made clear on the owners direct website that air-conditioning is not included in the price of the villa and it is an extra that needs to be paid -the amount requested did seem somewhat excessive to us. Overall though we had a great holiday and would recommend this villa. Many thanks for the review. Mattresses are branded Simmons (one of the best in the world). We are very anxious about the confort of our guests. Air conditioning is an extra as clearly stated in the rental agreement that you approved when you finalized the booking. The house is a big house and air conditioning is an high cost and we do not want to limit the use of it. I really hope to see you and your adorable family group in the property soon. Thanks again G. A.d.V. Beautiful location, just in front of the Etna vulcan. 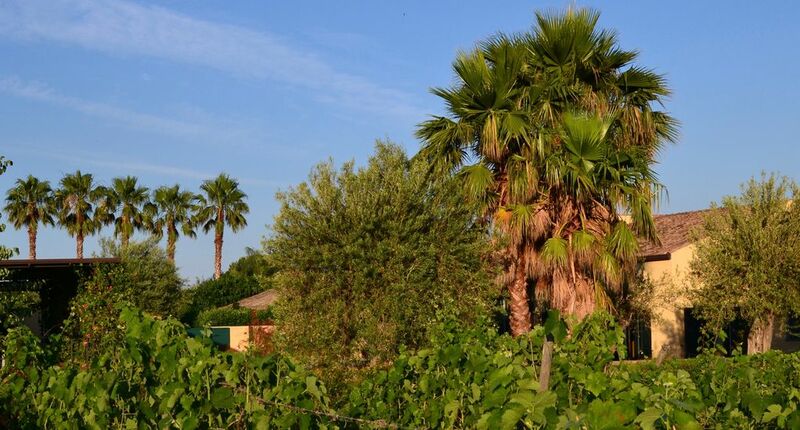 The resort is surrounded by vignards and fruit trees, very relaxing. A lot of care and attention to details. The rooms are spacious and clean. The best part is the assistance from the staff: friendly and professional at all times. I recommend the "granita" and pasta alla norma. Fantastic! Many thanks for the wonderful review ! Please come back again !! We stayed at Villa Etna for one week at the end of August/beginning of September. We had the most wonderful time. Monica, the housekeeper, gave us such a warm welcome and was brilliant throughout. Nothing was too much trouble for her and she was very knowledgeable about the local area, beaches, places to eat and visit. The villa itself was very spacious and immaculate. We had everything we needed. The pool was perfect, very clean and a lovely temperature. The location was brilliant, close to amenities and a very short drive from the beach, but because of the setting it felt as though it was the perfect rural retreat. Our two boys, aged 7 and 8 years summed it up as "the best holiday ever!". Thank you very much. We hope to return next year. We thoroughly enjoyed our time at the property. The location and views of Etna are second to none. The staff were excellent and very accommodating - Monica and Maria were superb! Would have no problem recommending this property. A great holiday in a lovely house! We had a great week at Villa Etna! The house is very well divided internally, well maintained and really well equipped! The air conditioning is very efficient, as it needs to be to cope with the intense heat one can experience in Sicily! The garden is large and there is an extensive covered area where one can take refuge from the hot sun as well as dine al fresco. From there the view of Mount Etna is stunning! Although the property is very close to the village, it feels quite remote. It is very quiet! The swimming pool was a huge attraction to our children, and much fun was had there! Everything is in perfect working order in the house, except for the wi-fi which is at times problematic, the signal is at times very weak. I understand the owner will be doing something about that! The manager is very attentive and efficient and will resolve any problems that can occur with great speed, and there is a cook for an outstanding Sicilian food experience (at extra cost). The surrounding area is very beautiful, with lots to do. We found a couple of beautiful beaches (don’t miss Lido dal Pirata). It is worth making sure you have proper instructions as to the location of the property and not just follow the satnav, I got totally lost trying to find it when we first arrived! Hello the wifi problem was sorted out. Many Thanks for the review. Prices can be changed by the owner before the booking. Vat included in the rate. Services and facilities included in the rates: full weekly linen and towels, daily rooms cleaning (except on Sunday), final cleaning, shaded parking area , wifi, daily pool cleaning and maintainance, weekly loan moaning, bowling green, barbecue area, night light in the garden, ice machine, 24 h. daily maintainor assistance. On demand: Air conditioning/heating daily € 40, cook available on demand. Services on demand must be paid cash at the arrival (no credit card). Pool available from Easter to November. Excursions can be organized for guests.